I know little of Shinegki no Bahamut (Rage of Bahamut) save for the fact that it is a collectible card battle game–a genre that has never managed to capture my interest–and that it features some wonderfully unrealistic fantasy armor designs of the variety that have been a popular target of the gaming press in recent years. The Dark General’s armor certainly exposes more skin than it covers, which is fine with me. I prefer to suspend my disbelief when it comes to armor design and would rather see form over function in most fantasy settings. As an aside, I find the design aesthetic strongly reminiscent of the Daedric armor from recent entries in the Elder Scrolls series. The name “Dark General” would seem to imply a demonic origin, so the similarity makes sense. Despite the generous views afforded by the aforementioned armor, this figure does not feature any sort of cast-off. Given that the cast-off feature was the main pain point with my other Amakuni figure, Leviathan, I’d say this is a good thing. The pose captures the Dark General looking like a woman of action, holding a rather ornate spear in one hand, while the other hand accentuates orders issued from her fiery countenance. Her hair and cloak billow outward, conveying a sense of motion while also affording a better look at the General’s attractive physique. The sculpt design is definitely one of the high points for this figure. The General’s hair is notable in that it starts as a matte white at the crown of her head and transitions to a translucent silver at the tips. I also find the hair seams a good bit more subtle in person than they come across in some of my photos. The Dark General is officially 1/8 scale. She’s not necessarily small for her scale, but she’s easily dwarfed by Kotobukiya’s Olivia and a number of other large-ish 1/8 scales that have come across my doorstep recently. I would hesitate to label her disappointing in this regard, but if I could change one thing about this figure, I would make her a bit bigger. The base design consists of what is essentially two clear plastic discs fused together, with the lower featuring a very subtle magic circle pattern. The design is perfectly functional, but the pattern is all but unnoticeable under normal lighting. 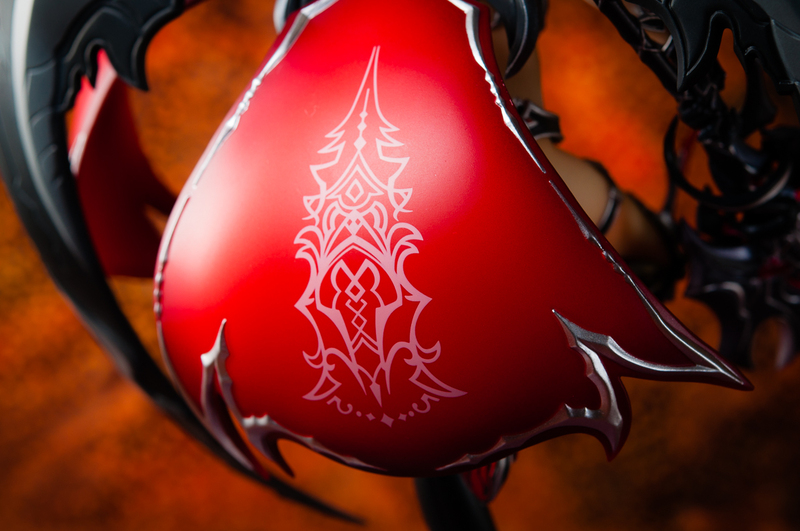 As with all Amakuni products, the Dark General was made available exclusively through Hobby Japan. There’s not too much to say that hasn’t already been said about exclusivity and figures. For better or worse, HJ seems to put out a lot of exclusive figures relevant to my interests. Despite the HJ exclusivity tax, the Dark General actually cost me about $30 less than Kotobukiya’s Olivia after shipping costs were factored in. All told, I’m quite satisfied with Amakuni’s Dark General. She could stand to be a bit bigger and she certainly could have been cheaper to take home without Hobby Japan requiring a middle man, but if you can accept those things, then this is a damn fine figure. 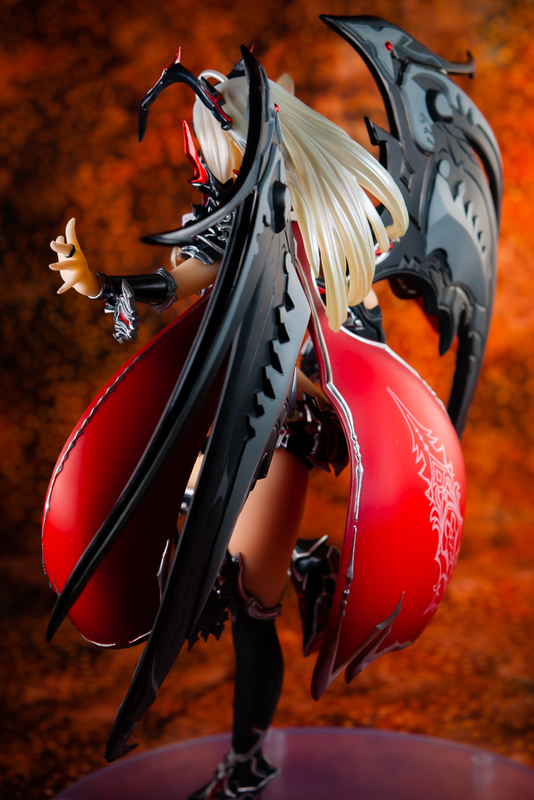 This entry was posted in Figures, Reviews and tagged 1/8 scale, Amakuni, Dark General, Hobby Japan, PVC, Shingeki no Bahamut (Rage of Bahamut). Bookmark the permalink. Thanks! I used one flash aimed through a makeshift softbox to illuminate the background and another placed about 60˚ from camera center (i.e., side-lit) for the figure itself. The background is the same one I used for my Canaan review. I wanted something with colors analogous to the accent color on the General’s armor (i.e., red). The armor looks pretty good on her, also the backside shows a nice profile. I also like her eyes, still I find her a little scary, which is appropriate for one called Dark General. Maybe the Dark Genera is a shorter kind of creature with her wide open mouth and the fang she strongly reminds me of the petite tsundere characters you often see in anime. In the picture of her with Olivia I didn’t get the impression of a bothering scale difference. Good luck with capturing Olivia, its quite demotivating when the first idea doesn’t work like expected. I also see a bit of loli-tsundere in the General’s build and bearing now that you mention it. That’s an archetype I seem to be drawn to more than most, so perhaps it’s not a surprise that I ended up with this figure. I feel there’s a good half- or full-scale difference between the Dark General and Olivia. Maybe it’s not so apparent in the photos you’ve seen, but if you saw both in person, I think the difference would be more apparent. I’m not particularly bothered that the two are different. I just feel like the General would benefit from being a bit larger for her own sake, given the amount of detail she has to offer. I’m not sure where to go from here with Olivia. She’s easily the most impressive product I’ve seen come out of Kotobukiya, which makes her worthy of some effort, I think. At the same time, I’m not keen on spinning my gears on one figure when I could be more productive with other subjects. While i was taking pictures of this figure and I kind of felt that her cape should’ve been cast-offable at least. Love pic no3 of this review! You make a good point about the General’s cape. It really hides most of the General’s body when viewing the figure from behind. I try to throw a handful of rear-facing shots into every review, even though I’m not overly fond of shots that obscure the character’s face, and I felt like it was even more of a reach than usual picking out a handful of such shots for this review.